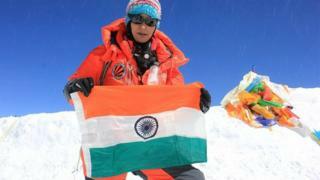 Image caption Anshu Jamsenpa also scaled Everest twice in 2011, but 10 days apart. An Indian has climbed Mount Everest twice in under a week in what may be a new woman's record for the fastest double ascent. The current Guinness record for a woman's double ascent is seven days. News of Ms Jamsenpa's climbs came as at least three climbers were killed on the mountain over the weekend. An Australian died on the Tibetan side, while a Slovak and an American died on the Nepalese side. Rescuers have failed to locate a fourth climber, from India, who disappeared shortly after reaching the summit. Hundreds of mountaineers are hoping to scale the world's highest peak before the monsoon sweeps in next month. It's the second time Ms Jamsenpa, who is from the Indian state of Arunachal Pradesh, has notched up an Everest double ascent. Her previous feat was in 2011, but those ascents came 10 days apart. The current woman's record was set by Nepalese climber Chhurim Sherpa in 2012. Apart from her two double ascents, Ms Jamsenpa also scaled the mountain in 2013. Her husband, Tsering Wange, told the BBC that her plan was always to do a double ascent twice, but her second attempt did not succeed in 2014 due to an avalanche and in 2015 because of the devastating Nepal earthquake.